This lasagna isn’t particularly fancy-pants or anything, but it is simple, delicious, and jam-packed with vegetables. A whole mess of them are pureed into the spicy, rich red wine tomato sauce, while the rest are incorporated into the creamy ricotta and cottage cheese filling. The sauce has a really lovely depth of flavor due to the complexity of the red wine, mushrooms, and tomatoes working together. Zak isn’t the biggest lasagna fan, but he did enjoy this one. 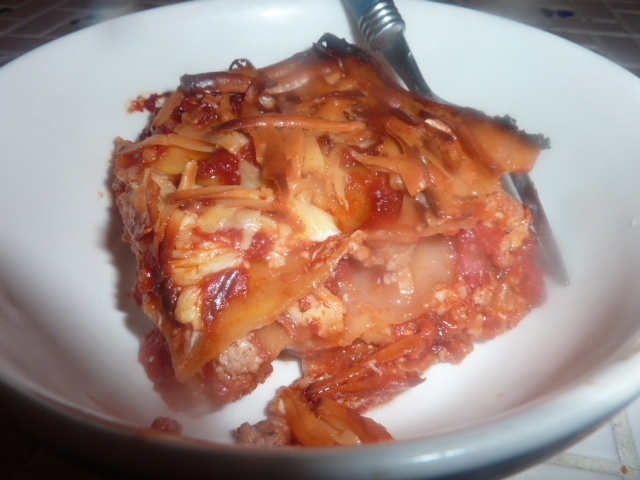 I kept the layers relatively thin and didn’t go hog-wild with the cheese, but added enough to make this lasagna cheesy and delicious. We both enjoyed the spice from the crushed red pepper flakes. We each ate a serving for dinner and again for lunch today, and I’m happy to say I had about 1/4 of it to freeze. It will be perfect to pull out on a lazy day for a delicious dinner. In a large sauce pot, heat olive oil over medium heat. Add garlic cloves and bay leaves and cook until fragrant and lightly sizzling, about 2-3 minutes. Add onions. Season with salt and pepper and cook until translucent, 5-6 minutes. Add green bell pepper and cook until tender, about 4-5 miutes. Add mushrooms and raise heat to medium-high. Season again with kosher salt and freshly cracked black pepper. Cook until lightly golden brown, 5-6 minutes. Add red wine to the pot. Bring to a boil and let boil 3-4 minutes until slightly reduced. Add crushed red pepper flakes. Add tomatoes and tomato paste and stir to combine. Reduce heat to low and simmer about an hour and a half until mostly reduced and thickened. Remove bay leaves. Using an immersion blender, blend until mostly smooth, including mushrooms. If necessary, simmer until thickened and reduced, about another 10-20 minutes. Taste for seasonings and stir in fresh parsley. Remove from heat. Heat olive oil in a medium sauté pan over medium heat. Once cooled, add drained ricotta, cottage cheese, and Parmesan. Season with salt and pepper and stir to combine. Place a serving spoon full of sauce on the bottom of a 9″ x 13″ casserole dish. Add one layer of noodles, overlapping by about 1/2″ inch. Place another serving spoon full of sauce over the noodles and smooth into an even layer. Add about half of the cheese and vegetable mixture and top with another layer of noodles. Add another smooth layer of sauce. Top with another layer of sauce and the remainder of the cheese and vegetable mixture. Add a bit more sauce and the final layer of noodles. Top with the remainder of the sauce and top with Parmesan cheese. Bake, covered about 40 minutes. Remove tinfoil and bake another 15-20 minutes until cheese is melted and golden brown. 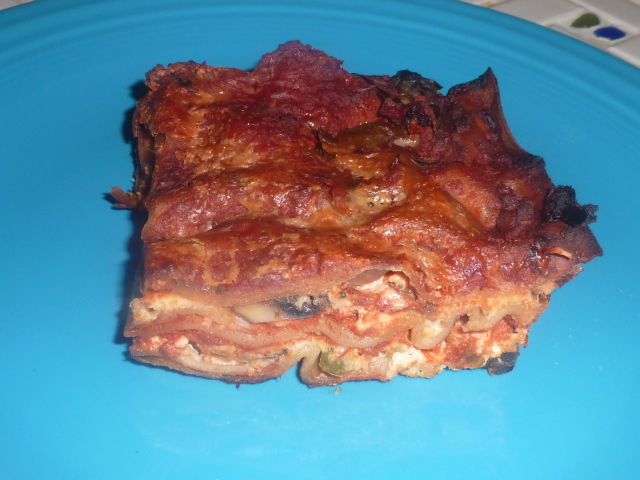 This was a lazy person’s version of lasagna, but was bursting with flavor nonetheless. The leftover chicken drippings added another layer of yummy, rich, roasted flavor to the leftover stuffing from the Vidalia onions I made the other day. The smoked gouda cheese really put this over the top. It was very delicious and heated up reasonably well the next day (the no-boil noodles get a little difficult to cut, but I neglected to bring a knife of any description so it’s likely a very remediable solution, and would certainly be fixed by using pre-boil lasagna noodles). If you don’t have the leftover stuffing from the Vidalia onions or the pan drippings from a roasted chicken, I suggest some ground turkey with thyme, rosemary, and a splash of chicken stock browned in a sauté pan as a replacement. In a large sauté pan, heat leftover drippings over medium heat. Add garlic and cook until fragrant, about 1-2 minutes. Add tomatoes and increase heat to medium-high. Stirring occasionally, cook 8-10 minutes until thickened. Spray a casserole dish with non-stick cooking spray. Spoon a bit of the sauce onto the bottom. Layer with 2-3 noodles. Top with about 1 cup filling and about 1/3 of the cheese. Add another layer of noodles. Add more sauce, another 1 cup of filling, and another 1/3 of the cheese. Top with one more layer of noodles, the rest of the sauce, and remaining cheese. Cover with tinfoil. Bake 25 minutes, covered. Uncover and bake another 15-20 minutes until cheese is melted and golden brown. Let rest 5-10 minutes before cutting and serving.